This pricing opportunity ended on August 31st, 2016. If you are interested in upcoming special pricing programs and group buys, please click here so we can contact you with future opportunities. DENC is excited to announce our new Summer EV Pricing Program. This July and August, Fort Collins and Loveland community members will have access to our special pricing for EV purchases. This special pricing opportunity is part of the DENC effort to continue making EV ownership affordable and convenient in our community, and is only available to community members through the DENC partnership. The program is in partnership with Co’s BMW, Dellenbach Chevrolet, Spradley-Barr Ford (currently sold out) and Tynan’s Fort Collins Nissan. These four dealerships are offering exclusive special pricing on their latest EV models including the BMW i3, BMW X5 40e, 2017 Chevrolet Volt, Ford Fusion Energi (currently sold out), Ford C-Max Energi (currently sold out), and Nissan LEAF models. To receive this pricing, community members must register through DENC by clicking here or the link below. DENC will then connect you with the dealership for a consultation and test drive. Only those who register will be able to access the special pricing, so be sure to register while supplies last. This pricing is available until August 31 or while supplies last at each dealership. Pricing is subject to change, but we will update this website as soon as we are notified of a change. Each participating dealership has offered a different discount for Northern Colorado community members. Please see the poster on this page for that discount. This pricing is only available when you register through DENC and is only available until August 31 or while supplies last. This means that the models at each dealership are likely to go fast, so we recommend you register because test drive appointments will be scheduled on a first-come, first-serve basis. The pricing is also subject to change and we will update this website as soon as we hear of a change. The numbers represented under state and federal tax credits are estimated calculations. We encourage you to visit our tax credit information page to understand how we arrived at these estimates. 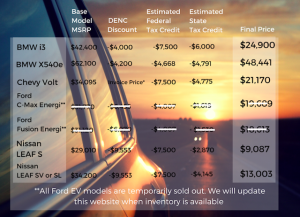 We also recommend that once you purchase your new EV, you speak with a tax credit professional about the process, or contact DENC if you would like help with the process. Further clarification on these amounts: The federal government offers a tax credit of between $2,500 and $7,500 for vehicles with batteries of at least 4kWh capacity. The Department of Energy and the Environmental Protection Agency update the list of eligible vehicles and the value of the credit for each eligible vehicle every year. Taxpayers must have tax liability equal to or greater than the credit to be eligible for the federal credit. The tax credit cannot be used at the time of purchase, but does reduce the taxpayer’s tax owed dollar-for-dollar. The Colorado innovative motor vehicle credit and the alternative fuel vehicle credit are refundable. The credit is first applied against the income tax liability of the person who purchases, leases, or converts the qualifying motor vehicle. If the credit exceeds the tax due, the excess credit will be refunded. If you have any questions, please contact Tim Prior at tprior@electrificationcoalition.org or (608) 358-5724. 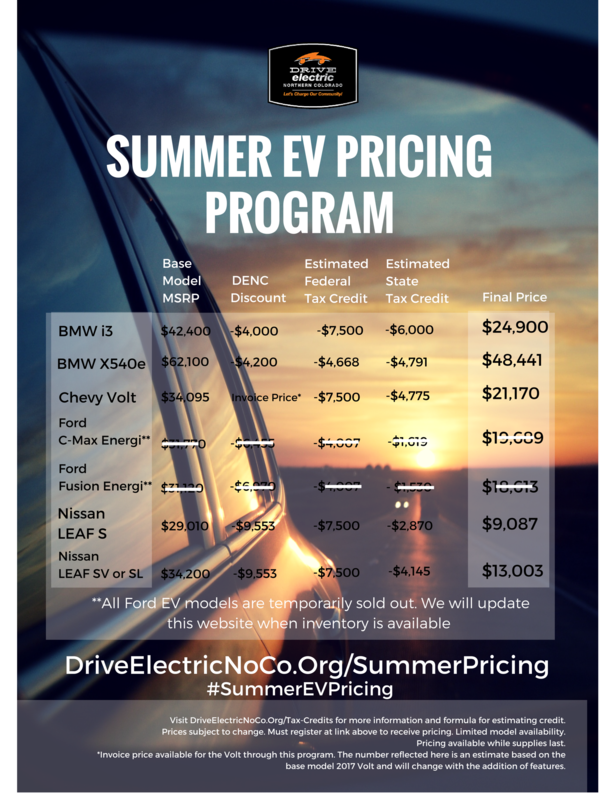 Have you purchased an EV through a DENC special pricing program like the group buy or Summer Pricing Program? Please share your story with us at info@driveelectricnoco.org so we can share your story as motivation for other EV owners to drive electric!